Last week the Economy magazine devoted a whole section of its issue to a topic we at Obecto hold very dear. 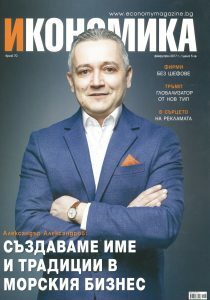 The section is published under the intriguing title “Company without bosses”. 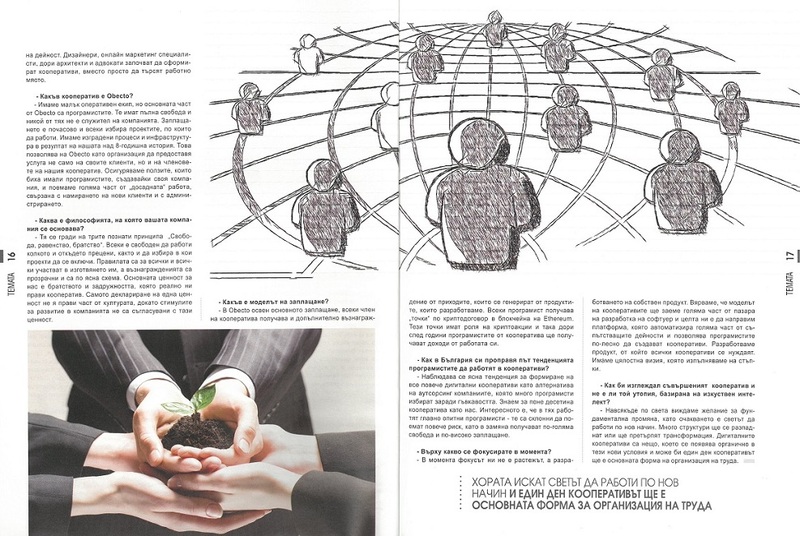 It explores this new wave of companies in a series of 3 interviews with Bulgarians, pioneering in the new organizational model – the digital cooperative. The pioneers in question – Vitaliy Filipov from Camplight, Marin Petrov from Hack and Paint and last but not least the founder of our digital cooperative, Todor Kolev. 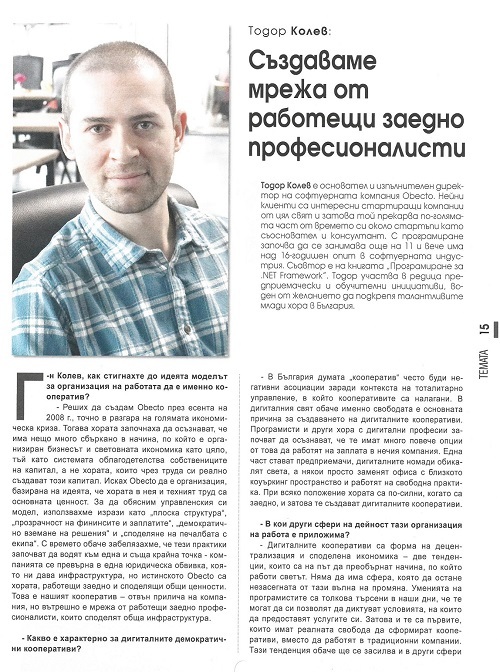 Below is a translation of his interview, discussing in details how Obecto arrived at this organizational model, what are the benefits for the developers working in the cooperative and what are our plans for the near future. 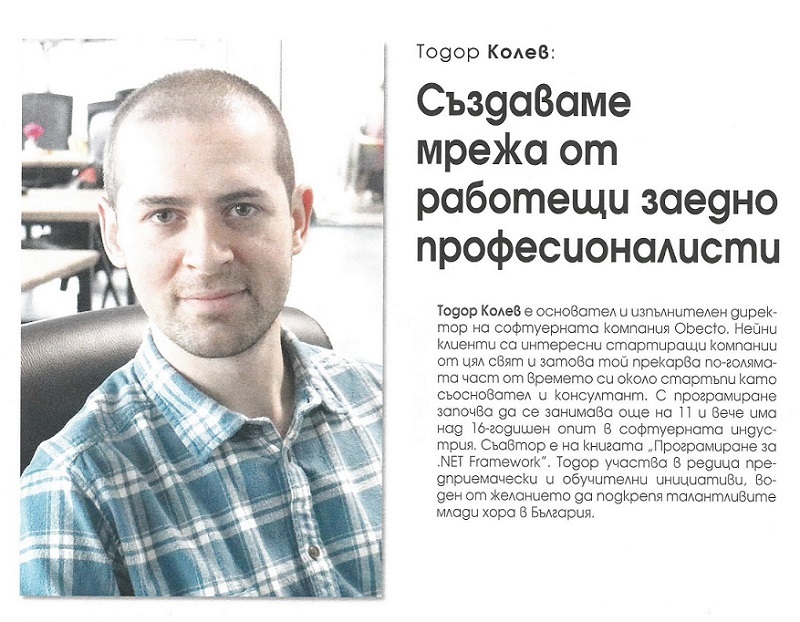 Todor Kolev is the founder of the software company Obecto. Its clients are interesting startups from all over the world. That is why he spends most of his time around startups being their co-founder or consultant. He has started programming at the age of 11 and nowadays he has more than 16 years of experience in the software industry. He is also a co-author of the book “Programming in .NET Framework”. Lead by his desire to support the talented young people in Bulgaria, Todor participates in a series of entrepreneurial and teaching initiatives. Mr. Kolev, how did you arrive at the idea that a digital cooperative should be the organizational model in Obecto? I decided to create Obecto in the fall of 2008, right in the middle of the big economic crisis. Back then, people began realizing that there is something very wrong in the way business and the world economy as a whole are organized. The system benefits capital owners and not the people who create this capital for them with their work. I wanted Obecto to be an organization based on the idea that the people in it and their work are the main value. In order to explain our organizational model we used phrases such as “flat structure”, “transparency of the finance and payments”, “democratic decision making” and “sharing the profit with the team.” However, with time we noticed that all these practices lead towards the same thing – the company turned into a juridical shell which gave us an infrastructure but the real Obecto are the people working together and sharing common values. This is our cooperative – it looks like a company from the outside, but from the inside, it is a network of professionals working together and sharing common infrastructure. What characterizes digital democratic cooperatives? In Bulgaria, the word cooperative is often negatively associated because of the totalitarian regime in which the cooperatives have been imposed. However, in the digital world, freedom is the main reason to create a digital cooperative. Developers and other people with digital professions are starting to realize that they have a lot more options than just working for a paycheck in someone else’s company. Some become entrepreneurs, digital nomads travel around the world and some just replace the office with the nearby coworking space and work as freelancers. Whichever the case, people are stronger when they are together and that is why they are creating digital cooperatives. In what other fields of activity is this way of organizing work applicable? Digital cooperatives are a form of decentralization and shared economy – two trends which are about to turn around the way the world moves. There will be no field of activity left untouched by this wave of change. Nowadays, developers’ skills are so sought after, that they can afford to set the rules at which they offer their services. This is why they are the first ones who have the freedom to form cooperatives instead of working in traditional companies. However, this trend will grow in other fields of activity as well. Designers, online marketing specialists, even architects and lawyers start forming cooperatives instead of just looking for a job. What kind of cooperative is Obecto? We have a small operational team but the main part of Obecto are the developers. They have full freedom and none of them is a company employee. They are paid by the hour and everyone is free to choose which project to work on. We have built our processes and infrastructure as a result of our 8-year-long history. This allows Obecto to offer a service not only to its clients but also to the members of the cooperative. We provide the benefits that the developers would have if they found and managed their own company, and we take over a significant part of the “boring” tasks connected with finding new customers and administration. On what philosophy is your company based? It is based on the three renowned principles “Freedom, equality, fellowship”. Everyone is free to work as much as they want to and from wherever they want to, as well as to choose the projects to work on. Rules are for everyone and everyone takes part in creating them and the remunerations are transparent and clear. The main value for us is the fellowship and togetherness which actually turns us into a cooperative. Just declaring a value does not make it an integral part of the corporate culture. It has to be in sync with the incentives for future development as well. What is the remunerations model? In Obecto, besides the fixed remuneration, every cooperative member receives, there is an additional remuneration from the income generated by the products we develop. Every developer receives “points” according to a crypto contract in Ethereum’s blockchain. Those points represent crypto shares which means that the developers from the cooperative will receive income from their work years later. How does the trend of developers working in cooperatives make its way in Bulgaria? We are observing a clear trend of forming more and more digital cooperatives as an alternative to the outsourcing companies, which developers choose because of the flexibility. We have heard about at least ten other similar cooperatives. What is interesting about them is that mainly experienced developers work there – they tend to take more risk and in return, they get more freedom and higher payment. Currently, we are focused not on growing, but on developing our own product. We believe that the cooperative model will take a significant part of the software development market and our goal is to create a platform which automates a significant part of a cooperative’s activities and enables developers to create a cooperative easier. We are developing a product which every cooperative need. We have the overall vision which we are executing step by step. How would the perfect cooperative look like and isn’t it a utopia, based on the artificial intelligence? All over the world, we are observing the desire for a fundamental change and the expectation is that the world will work in a new manner. Many structures will fall apart and will be transformed. The digital cooperatives are something that appears organically in those new conditions and maybe one day the cooperative will be the main form of organizing labor.